Kokomo's is the latest venture by Michael and Peter Harrington (of Sage Dining Rooms and AKIBA fame). It's located on Bunda St in the space previously home to Tongue and Groove and opened in early June to great fanfare - with Boy George headlining the launch. The 4.5 million dollar Pacific Island themed fit-out seats up to 450 people and is a mix between a restaurant, bar and club. We decided to check out the dining aspect mid-week. We were seated upstairs in a round booth. I was worried the heat would rise and we would get too warm. It didn't get too bad by the end of the night and when we went downstairs it was definitely significantly cooler but also significantly LOUDER too (I think we were better off seated upstairs for dinner). Seating is an increasingly important aspect of dining for us. With Macgyver Husband's height, his long legs were a bit cramped under the table and the backing of the booth didn't go up very high. For such an expensive fit-out, we thought the seating could have been a bit more comfortable. Kokomo's Island Banquet costs $49 per person for 8 of their most popular dishes. Only an extra $1 to add a key lime pie. We made sure to let the wait staff know I had pregnancy dietary requirements. The pace of food delivery was very fast in the beginning, with 4 or 5 dishes coming in quick succession and filling the small table. Because of this, there was confusion as to what my pregnancy substitute was for the mullaway ceviche (and any other dishes). Was the taro chips my substitute or the lamb ribs? Could I eat the sauce in the chicken buns? As the dishes were delivered, there was no communication and I had to question every dish because I didn't know if I was getting a separate dish or if I could eat what everyone else was eating. It was extremely frustrating and not a relaxing dining experience. In terms of the taste of the food, I was impressed with some dishes and not with others. The taro chips were crunchy but lacked the advertised "salt and vinegar" flavour at all. My cheese steak slider was a winner though and based on my friends' assessment of the ceviche, seemed to be the better dish. The prawn toast was a modern (and somewhat bland) take on prawn toast, but I preferred the flavours of the more "traditional" prawn toast you would find at an Asian takeout joint. 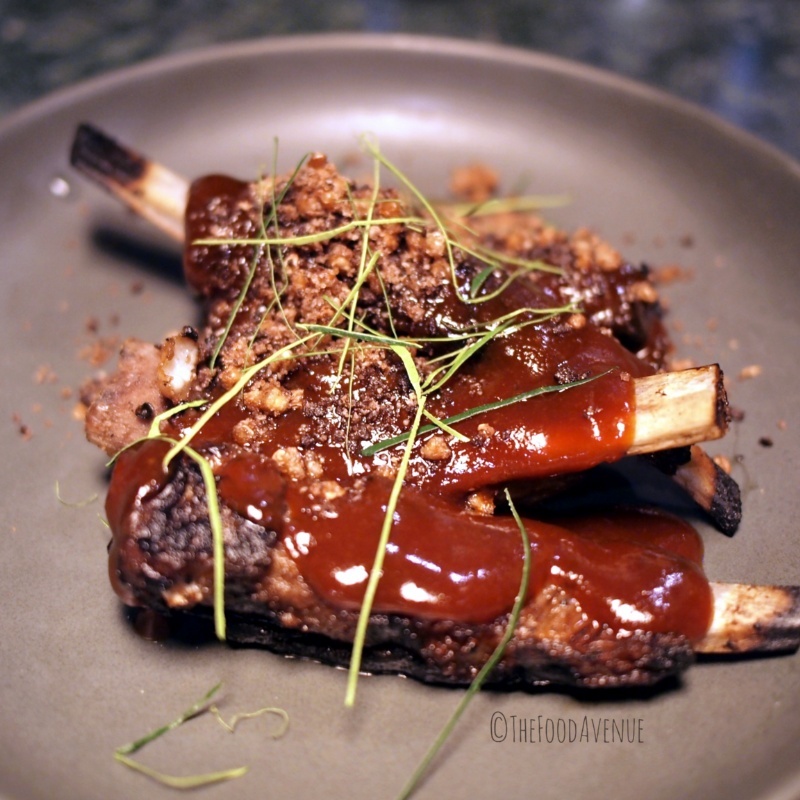 The lamb ribs was one of my favourite dishes - spot on with the sticky glaze and the meat fell clean off the bone. For me, the fried chicken bun was nothing special but my dining companions enjoyed theirs. I didn't enjoy the flavours of the rotisserie chicken and the beef rib that much, but did appreciate that the meats were cooked to perfection. In contrast, the udon noodles and iceberg salad were highlights for me. The noodles had a fantastic umami flavour and the iceberg salad was deliciously crunchy and creamy from the creme fraiche. In fact, I missed the iceberg lettuce salad so much that I have been recreating it at home and eating it daily for the past week! The pace of food delivery slowed down significantly after the udon noodles and we noticed the upstairs tables filling up with diners. The key lime pie was delicious and worth the extra $1 per person. This reason, as well as a glowing recommendation for the pecan pie from another friend, convinced us to also order a pecan pie to share. There was a long wait between the end of the banquet and the arrival of the lobster lollipops (which we had ordered as an extra dish when we ordered the banquet). After we checked with the wait staff, it came out about 15 minutes later. I checked about the sauce and found out it was not pregnant friendly. So I decided to forgo it until we found a stick that had minimal sauce on it. Macgyver Husband bit off the parts that had sauce on it so I could have the rest. And it was disappointing. The meat on the stick could have been any kind of similar crustacean meat. And the lollipop was flavourless without the sauce. Definitely not worth $4.5 a pop. When we inspected the bill, we had been charged twice in error for the lollipops too, which was remedied. The pecan pie, unfortunately, was also disappointing and not worth the calories. Communication from wait staff was hit and miss and the pace of food delivery was very inconsistent. We felt very rushed at the beginning and impatient at the end. Our bill for 4 people came to $270, which also included a beer, a Pepsi and two mocktails ($8 ea). Overall, it was a fun night due to the company and the food was ok but the dining experience wasn't the best. If you want to try Kokomo's for yourself, I recommend the Maui cheese steak, Udon noodles, Iceberg salad (although it's pretty easy to recreate at home) and the Lamb ribs.